The title inspired by The Firm, it was a toss of a coin between that one and 'There's Short-eareds on the river wall, riverwall; there's Short-eareds on the river wall, riverwall, Jim'. 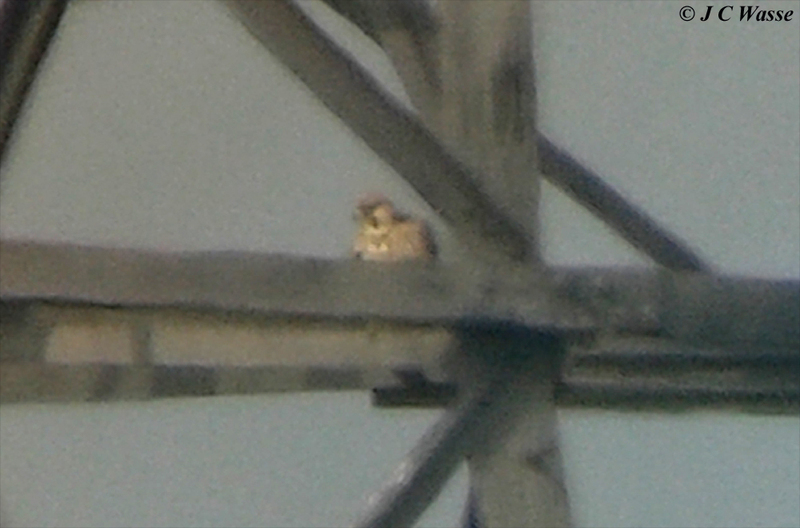 Last weekend the big brown falcon lay siege to Wennington Marsh/ Target Pools taking up base on the nearby pylons. 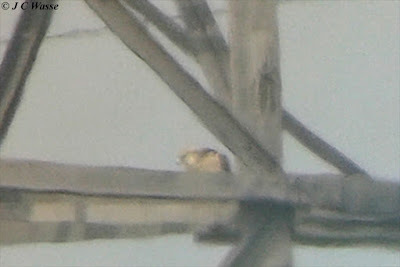 A big brute and it looked like the falcon seen a few weeks ago. The question is, what is it? Closed wing seen briefly to judge wing tip to tail tip. Looked like wing tip approached or was equal to the tail tip. Pale cheeks looked considerably whiter than the underparts. White supercilium stronger behind eye forming a wrap around. Crown pale with feathers above 'super' looking a bit chestnut in strong light, but looking really white crowned in dull light. Dark moustache stripe extensive looked black and appeared to be broader at the tip. Black extending to behind the eye. Underwing barred and appeared to be uniform, didn't note a contrast between underwing coverts and rest of wing. Pattern close to immature Peregrine shown in 'Collins' guide. Tail paler than upperwing and tip looked dark but not black. Hunting style. Low level attack frightening anything in its way. Does this style of hunting betray it's identity or parentage? 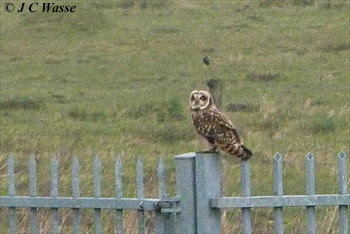 The Short-eared Owls were as stunning as ever showing well mid morning last Saturday as the mist gave way to low cloud. Several photos below. Less than 100 yards away 3 Avocets graced Aveley Bay and 10 Black-tailed Godwits fed quietly. Later a group of 70 + 4 'Black wits' flew onto the reserve, some acquiring summer garb. Of note in warmish conditions on the Saturday (12th) was the clear out of say between 500 and 1000 Black-headed Gulls heading high east continent bound during mid afternoon over a couple of hours. A full days count would have revealed a much bigger movement. Similar but colder conditions on Sunday saw no such movement at all.